Once a year, in November, the graduate students in the Stanford and Berkeley Economics Departments get together for the Little Big Game, a series of contests in basketball, volleyball, Frisbee, touch football, and soccer. The Little Big Game takes place in the days before the Big Game between the Stanford-Cal varsity football teams. This year the Little Big Game was held at Berkeley, where the Big Game between 6th ranked Stanford and unranked Berkeley will take place tomorrow. I am happy to report that the Little Big Game was great this year for the Stanford team, which racked up 3-1-1 won-loss-tie record, much better than last year’s 2-3 record. Stanford won in basketball, volleyball, and Frisbee, lost in football, and tied in soccer. 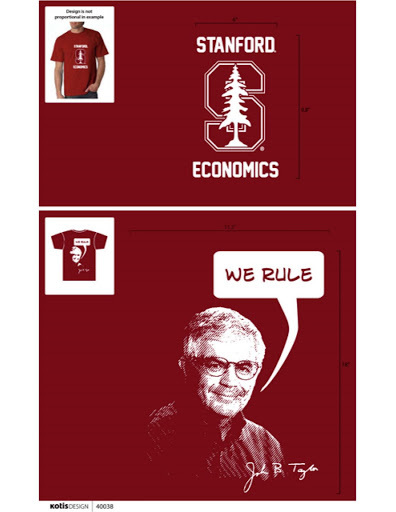 In case you’re wondering, I’ve included a picture of the front and back of the Stanford economics team’s t-shirt uniform for this year’s Little Big Game.